Bring the joy of ice dancing into your home with Joyous Waltz! 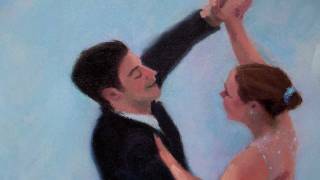 The lean of the skaters' edges, the elegance, emotion and sparkle of the ice all come alive in this one-of-a-kind work of ice dancing art, by portrait artist and figure skater, Lauren Bass. Joyous Waltz is offered to you as a giclee print - a museum quality fine art print, capturing all the color and detail of the original oil painting, at a fraction of the cost. Sure to put a smile on your face every time you look at it, Joyous Waltz makes a beautiful addition to your home or office. A great gift for any ice dancer, or figure skating fan. This ice dance painting fits a standard 18 x 24 or 16 x 20 inch frame. Check it out today on our website! In Learn to Ice Dance Vol. 2, U.S. national gold medalists Julie Keith and Mike Ricigliano provide a top-notch visual demonstration of the bronze and pre-silver compulsory pattern ice dances of the U.S. Figure Skating test structure. Designed to complement your own learning and practice, Learn to Ice Dance Vol. 1 breaks down the steps to each dance in slow motion with narration, explains basic partner holds and new steps for each dance, reviews timing information, and provides a visual layout of each dance pattern on the ice. The Tango is a silver level pattern ice dance in the U.S. Figure Skating test structure. The Foxtrot is a pre-silver level pattern ice dance in the U.S. Figure Skating test structure. The Ten-Fox is a bronze level pattern ice dance in the U.S. Figure Skating test structure. The Willow Waltz is a bronze level pattern ice dance in the U.S. Figure Skating test structure. The Hickory Hoedown is a bronze level pattern ice dance in the U.S. Figure Skating test structure. The Fiesta Tango is a pre-bronze pattern ice dance in the U.S. Figure Skating test structure.